Surround loops are named for their 4 curvy loops that will surround a smaller bow layered on top of it. Perfect for stacking, these versatile loops will enhance any Classic or Twisted boutique bow that it is paired with, giving dimension and eye catching flair. 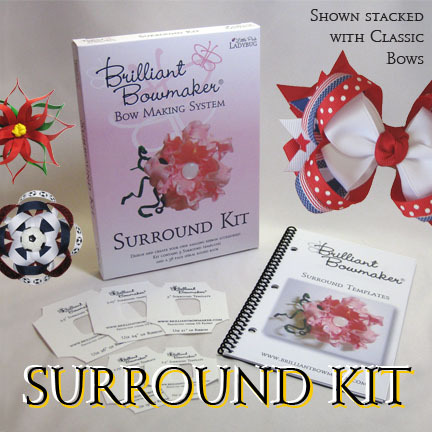 Surround Loops also work beautifully on their own, producing beautiful blooms like posies, sunflowers and poinsettias, and are also useful for making spirit pin medallions, and reusable gift bows. Kit includes 5 sizes of surround loop templates and spiral bound instruction and idea manual. Shipping is USPS Priority or Priority International. No items will ship until extra shipping invoices are paid.��US residents will receive a shipping notice from paypal when your item is shipped. International shipments are manually taken to the PO.